Are you considering having a book ghostwritten? You might be surprised to know how often it happens these days. It fuels entire franchises like Goosebumps, Sweet Valley High, and Nancy Drew. It’s also a huge part of the Tom Clancy book empire, as he claims he’s simply a better “idea man” than a writer. There’s even a few great ghostwriting scandals, like whether or not Capote actually wrote To Kill A Mockingbird (he didn’t). However, many people who employ ghostwriters are entrepreneurs, coaches, or other professionals seeking to create a book, but don’t have the time, effort, or desire to invest in the writing process. Instead, they’d prefer to use their energy in directing the process, working hand-in-hand with a professional writer to develop the best book possible. Making the decision to hire a ghostwriter can be stressful, though. There are many considerations to make and many questions to ask. Your relationship with your ghostwriter will be personal and long-lived. Books aren’t created in a matter of days. Instead, it can take months of hard work – even with someone else behind the keyboard – as you work together to capture your unique idea and voice, translating it into the book you envisioned. Many ghostwriters work under an non-disclosure agreement that makes it difficult for them to highlight the full scope of their work, but that doesn’t mean that they shouldn’t have a robust portfolio to share with you. As you read their samples, keep your eyes open for a flexible style that seems to mesh with each different topic comfortably. Also look for flexibility in voice. Does the writing sound different in each sample? If so, you know you’re working with a high quality ghostwriter! 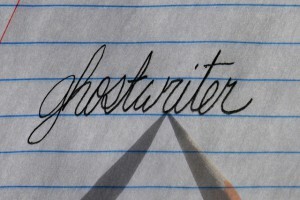 You must feel like you can trust your ghostwriter. If they have some past clients for you to interview, do so carefully. Ask questions about their entire process and inquire about any red flags. Ultimately, you need to trust your gut feeling when you talk to a potential ghostwriter. Working well together is necessary. Spend some time thinking about how you work best before you start interviewing your prospective ghostwriters. Most of the time, you’re going to have a virtual arrangement, working with your writer long-distance via phone, email, and/or Skype. If you feel most comfortable face-to-face, invest in a good web cam and make sure your writer is comfortable with that up-front. If you’re happy working on the phone, discuss that, as well. Taking the time to make sure you’re on the same page will make the process much smoother.